We’d love your help. Let us know what’s wrong with this preview of The Firm by John Grisham. Mitch McDeere, a Harvard Law graduate, becomes suspicious of his Memphis tax firm when mysterious deaths, obsessive office security, and the Chicago mob figure into its operations. To ask other readers questions about The Firm, please sign up. Why would they make a movie of this? Anyone famous gets his books made into movies or films but if the characters are weak and not realistic. I liked the book but not translating into a, wouldn't you say?movie and a T.V. series is just ballistic. Lawrence Arnow They make movies & TV series out of junk but then they always have; these people in "power" have no common sense whatsoever, if they did they…moreThey make movies & TV series out of junk but then they always have; these people in "power" have no common sense whatsoever, if they did they would be actually doing "something" & producing something besides the garbage they deliver onto screens from books written by "famous" people like Sarah Palin, who head is filled with air, hot air. What is this book exactly? It is not the book I read. Why 76 pages? Who is Robin A. H. Waterfield? First of all, because of this book, I took up Accounting as my major in college. This book painted a very exciting picture of how an accountant's life could be very exciting. It showed how he could steal from the Mob and get away with it. Who wouldn't want that kind of exciting life? You should realize that I read this book when I was in high school, and yes I knew it was fiction, but I was young and gullible. I didn't know what I wanted to do with my life and I read this book. It made an quite an impression on me. Of course, after 4 years in college and about to graduate and become a CPA, I've realized that being an accountant is not all that exciting after. Like seriously. It's not. Don't be an accountant. You'll die of absolute boredom. Second, it cemented my desire to be a lawyer. Even when I was younger, I already wanted to be a lawyer, but was unsure on what pre-law course to take (hence, the accountancy major). I was argumentative opinionated and I had a domineering and arrogant personality. Perfect lawyer material right? So this book is the reason why I'll go to law school after college. The Firm is very extreme and often unbelievable, but it's still a very well-written and gripping story nonetheless. I read this back when it was first released in 1991! At the time I was a teenager who was getting on a plane to visit relatives and I needed something to read to pass the time. THE FIRM distracted me the for the long plane trip. Just recently I was at the used bookstore looking for a book for my teenage son to read while he is gone for the next 10 weeks working at a Boy Scout camp as a lifeguard. The series he is reading wasn't available so I started searching for an alternative. The only books I read this back when it was first released in 1991! At the time I was a teenager who was getting on a plane to visit relatives and I needed something to read to pass the time. THE FIRM distracted me the for the long plane trip. I had to think back to my 'before romance reading days' to come up with something. I grabbed this book and packed it for him. A week and half ago we had to have him at the camp by 9 am which meant we had to be on the road by 6 a.m. to make it there with no time to spare. 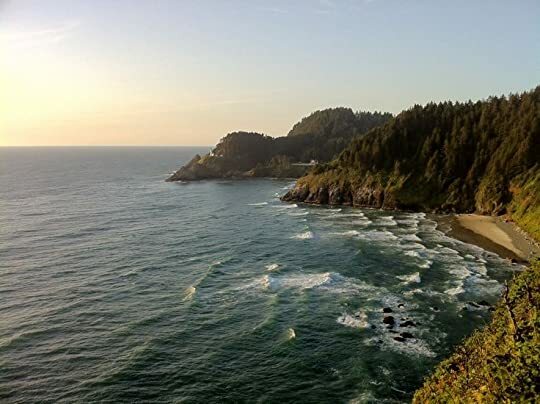 *on a side note...the camp is located on the Oregon coast. The camp owns 2 miles of beach. * After we dropped him off we started heading home along the coastline. We pulled into a small town and found a used bookstore because we needed something to listening to while passing the time in the car. We saw this book on audio cassette and bought it. Listening to it made me laugh because it had some cheesy music that transitioned the scenes. I'll be curious to see if my son will even read it. The last time I talked to him he had not even cracked the book open. Mitchell McDeere graduates from Harvard Law and is about to begin his career as a lawyer. Blessed with superhuman capabilities handed down generously by Mr.Grisham himself, Mitch finds no trouble in getting nailing three top job offers: two from from Wall Street, one from Memphis. Among other things, Mitch graduates with top honors, is among the top five in his class, was a quarterback at school, is an athlete (but his diet is mainly alcohol and cheeseburgers for the remainder of the novel), wor Mitchell McDeere graduates from Harvard Law and is about to begin his career as a lawyer. Blessed with superhuman capabilities handed down generously by Mr.Grisham himself, Mitch finds no trouble in getting nailing three top job offers: two from from Wall Street, one from Memphis. Among other things, Mitch graduates with top honors, is among the top five in his class, was a quarterback at school, is an athlete (but his diet is mainly alcohol and cheeseburgers for the remainder of the novel), works for 20 hours a day, and, of course, requires hardly any sleep. Yet, unwittingly (oh, how I love the innocence), lured by money and associated perks, our man finds himself as a tax lawyer in the Memphis law firm Bendini, Lambert & Locke, where more sinister dealings happen under the cover of a legitimate law firm business. The story-line never launches itself into the epic thriller that the plot threatens to become, the pace is completely off, and I can safely say that there is no single point of real suspense in this novel thanks to the some early giveaways with which you can construct most of what's about to happen (mhmm, no twists either). The novel starts somewhat promising but crumples into a muted, unimaginative ending with nothing much left to say. The book is so full of repetitions it makes you want to kill yourself for reading it. Every single bar in the Cayman Islands that finds mention in the book involves the three same things. Always! Islanders are playing either darts or dominoes. There is always a band that is tuning up. Mitchel orders the same kind of beer and cheeseburgers. Our guy Mitch barks orders to an FBI Special Agent in the early parts, and the relationship deteriorates later when Mitch can't help calling Tarrance an idiot every time he is required to say something. Not joking. Tarrance is a sock puppet character who does not come up with any good ideas during these conversations. Why converse at all?!!! Sadly, Tarrance is made to alternate between: "Will do", "I'll ask my boss", or make some feeble attempt at bargaining in a deal or ask a stupid question. The last three options don't bode well for poor Tarrance, and all such replies are followed up by Mitch calling him an idiot. When the FBI and the Mafia are hot on his tail, Mitch also finds, serendipitously, the assistance of an ex-con while being holed up in a room at a seedy Motel along Pacific Beach. The Mafia also give false leads to the FBI to throw them off his trail. Who needs the FBI, right? The absolute worst--and this no writer should engage in--is an extended recital of the events occurring up to a certain point in time in the form a nervous realization by one of the characters, completely ruining the pace and putting the reader to sleep. Eventually you will be tempted to assume that Grisham doesn't have a brain. The book fails to entertain just as much as it fails to inform. The uninspired title should've been a giveaway, but I read the book only because I heard that this was Grisham's big break that made him famous in the 90s. I most certainly can't see how. I don't advise you to try either. Yuck! This is quick, because I can't imagine anyone who has never read a Grisham novel/watched a 'film' adaptation of a Grisham novel/read a book review of a Grisham novel/watched that episode of 3rd Rock From the Sun all those years ago where the family goes into Witness Protection for some reason and they're all reading different Grisham novels, and when they realize the plot is exactly the same, they switch books and continue reading and sure enough, the plot is exactly the same. And yes, I've just This is quick, because I can't imagine anyone who has never read a Grisham novel/watched a 'film' adaptation of a Grisham novel/read a book review of a Grisham novel/watched that episode of 3rd Rock From the Sun all those years ago where the family goes into Witness Protection for some reason and they're all reading different Grisham novels, and when they realize the plot is exactly the same, they switch books and continue reading and sure enough, the plot is exactly the same. And yes, I've just spent about ten minutes searching the interwebs for the clip that apparently only I can remember, because I have an inordinate amount of brain sludge in my cerebral cortex. II. A lawyer who has become disillusioned with the system, but will give it one last try. D. The case he's currently working on has ties to the evil health care industry. c. Is able to prove the conspiracy. The Firm is I, A, 2, b, I, $10 million. This book is really interesting, well written and absolutely irresistible. I'm on a mission to read every book that Grisham wrote, because his books never disappoint me. Am citit acearta carte in vacanta la tara cand eram adolescenta. Foarte bine scrisa si actiunea este bine gandita, te tine intr-un ritm alert si in suspans pana la ultima pagina. Mitch McDeere is near the top of his Harvard Law School graduating class and can virtually have his pick of jobs with high-powered Wall Street firms. But at the last minute, he agrees to an interview with a small Memphis firm, Bendini, Lambert & Locke. The firm's search committee has carefully vetted Mitch and has selected him as their number one draft pick for the year. They bring Mitch and his wife Abby to visit Memphis and make him an offer that is too good to refuse. Mitch accepts the off Mitch McDeere is near the top of his Harvard Law School graduating class and can virtually have his pick of jobs with high-powered Wall Street firms. But at the last minute, he agrees to an interview with a small Memphis firm, Bendini, Lambert & Locke. The firm's search committee has carefully vetted Mitch and has selected him as their number one draft pick for the year. They bring Mitch and his wife Abby to visit Memphis and make him an offer that is too good to refuse. Mitch accepts the offer and is determined to be the hardest-working, most successful associate that B,L&L has ever seen. But he doesn't even have his feet on the ground before two of the other associate die in an apparent diving accident. Shortly after this tragedy, Mitch is contacted surreptitiously by and FBI agent who tells him that the deaths were not accidental and that no lawyer has ever left the firm alive. The FBI insists that Mitch's new firm is a wholly-owned subsidiary of the mob. The Fibbies want McDeere to become their inside informant to help them bring down the firm. If he won't, the agents tell him that when the firm does go down, Mitch will be convicted as a willing participant in the firm's illegal activities. McDeere is obviously caught between a rock and the proverbial hard place: If he doesn't help the FBI, he's going to wind up in jail, but if he does, he could wind up in the grave. The only way out is for Mitch to prove that he's smarter and more resourceful than either the FBI or the mob. Grisham is an excellent writer who writes fantastic legal thrillers. This is one of the best I have read by him! The sole reason I started reading this book was that it was the only literature at hand at my new place. Can you say b-o-r-i-n-g? Highly recommended for beginners and people who don't know what a good book really should be. Update: I can't take it anymore. Dropped! 4 stars. ⭐⭐⭐⭐ I loved this so much. عندما كنا في كلية الحقوق كان لدينا أفكار نبيلة عن الطريقة التي يجب أن يكون عليها المحامي الجيد . بطل حقوق الإنسان ، المدافع عن الدستور ، حامي حمى المظلومين ، المؤيد لمبادئ عملائه . لكن بعد أن تمارس المهنة لمدة ستة شهور تدرك أننا لسنا سوى بعض المرتزقة . أبواق دعاية معروضة في المزاد لمن يدفع أكثر ، و متاحة لأي شخص ، أي منحرف ، أي حقير معه ما يكفي من المال لكي يتحمل أتعابنا الضخمة . لا يجب أن تجعل أي شئ يصدمك . من المفترض أنها مهنة شريفة و لكنك سوف تقابل الكثير من المحامين المنحرفين حتى أنك سترغب في الإستقالة و البحث عن عمل شريف . Wow! That's all I can say about The Firm, I can't believe I didn't read it sooner, it's what I called a classic edge of your seat thriller, it was a lot better than the movie I thought, John Grisham does a great job explaining the legal system, this is my second book by Grisham and it certainly won't be my last. 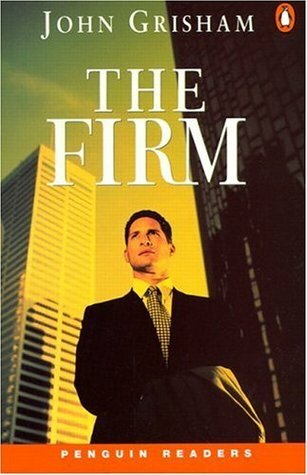 Anyone that's looking for a good legal thriller I recommend The Firm if you haven't read it already. The Firm by John Grisham will draw you into a situation where the choices you make not only affect you, but also the people who depend on you. When a young lawyer named Mitch McDeere has to choose between staying with a corrupt business or doing the right thing.The decisions that are made throughout the book are told by the lawyer Mitch. The story is centered around Mitch McDeere. He finished 3rd in his class at Harvard Law School. All the top law firms are trying to get Mitch to work for them. He decides to join a small firm in Memphis called Bendini, Lambert & Locke. They offer him a deal he finds hard to refuse. Upon joining this firm, Mitch would be paid $80,000 a year with regular increases, and the firm supplying him with a brand new BMW, a low rate mortgage, and clearing his student debts. Mitch comes from a poor family and is extremely proud of himself for managing to get such a great job. He and Abby, his wife, move to Memphis to start their new life, and for Mitch to start his new job. Mitch has an older brother named Ray who was charged and found guilty of 2nd degree murder. Ray is fluent in at least four languages that he has studied before and during his prison sentence. He often speaks Spanish with his brother, although Mitch isn’t as good as Ray is at it. Ray often talked about visiting different countries: “I’ve been reading about the Greek isles. I plan to go there soon.” Mitch thought this was funny because Ray still had seven years left until parole. Two of Mitch's colleagues die in a scuba diving accident in the Cayman Islands the week he starts at the firm. During a memorial service at the firm for them, Mitch notices plaques commemorating three other attorneys who died while working at the firm. He was suspicious so he hired a private investigator named Eddie Lomax, an ex-cell mate of his brother Ray, to investigate the deaths of the attorneys. Mitch was always one step ahead of everyone but little did he know that he would have to take down the people that hired him. The book makes you want to read it to find out how Mitch gets himself out of his little problems and also his final big problem. I like the way John Grisham makes Mitch seem like a normal person, and then he becomes smarter than everyone around him. Even though this story is fictional, you feel as though John Grisham has explained it as though he had experienced it before. This book makes you wonder what you would have done if you were Mitch, as he tries to keep his bosses, the Mafia, from finding out about him talking to the FBI. I think that the theme of the story is about making choices you will have to live with. The Firm is a good example of how large corporations can deceive and manipulate their employees with money and blackmail. This book shows how deception and betrayal are everywhere, including the people who are supposed to fight for justice. I really enjoyed this novel although I don't think that the finale lived up to the excellent start. I have seen the film and for me it did edge the book. The book flows in the usual Grisham style and is a very easy read. I love the way he writes and find that I nearly always finish them within 2 days. I thought this was a poor book at best. Then I read this lovely headline today. It's a good thing he became an author. He would make a rather poor defense attorney. One of the best books I've read in a while! Always loved me a good thriller. This has it all. Intrigue, suspense, passion, complexity, and plenty of twists. As with all great old works, there are plenty of long reviews out there already. So I will keep this short. Exactly. 3.0 to 3.5 stars. My first Grisham novel, I thought this was a fun, fast read with a very interesting plot. Being an attorney (in fact reading this while I was a first year law student) I think both helped andhindered my enjoyment of the book. On the positive side, I really liked the setting and relate to Mitch. On the negative side, I was also able to see the "flaws" in some of the major plot points. However, overall I enjoyed it. This is a re-read, so no rating. that would be like stuffing the ballot box. I didn't mean to make this book currently reading. I'm just reading it again because I'm about to see the movie, which, believe it or not, I've never seen. Sorry friends, I won't do this again. I felt dirty for enjoying this book, hence the three stars. You can't help but power through Grisham's story but it is just so incredibly mindless and over-the-top that I am almost certainly dumber for having read it. If I remember correctly it was the poor character development that really pissed me off - the protagonist is superhuman in every way, it's as if Grisham has just selected Mitch's qualities from a moronically obvious list titled 'characteristics that will appeal to pulp corporate th I felt dirty for enjoying this book, hence the three stars. You can't help but power through Grisham's story but it is just so incredibly mindless and over-the-top that I am almost certainly dumber for having read it. If I remember correctly it was the poor character development that really pissed me off - the protagonist is superhuman in every way, it's as if Grisham has just selected Mitch's qualities from a moronically obvious list titled 'characteristics that will appeal to pulp corporate thriller readers'; brother died in vietnam, other brother a rogue, he barely sleeps, works 100 hr weeks, has an unusually sharp memory, studied hard and came near top of his class despite hardship, was a football star, hot girlfriend, and if I remember correctly (though I could be wrong) he runs like 7 miles a day? That really annoyed me - not because it stood out among all the other ridiculous qualities, rather because the lack of consideration inherent in having a character who can do more than is physically possible with his time is symptomatic of the general thoughtlessness of the novel. Who the hell can run 7 miles a day while attending uni full time, studying, spending time with a girlfriend and working night shifts to pay his way through uni? I was amazed this was so popular. And it surprised me when I found out that Grisham was really a lawyer, because the book is entirely lacking in believability regarding the details of legal practice. An excellent legal thriller. One of John Grisham's best novels. The story centers on a young intelligent lawyer, Mitch Mcderee who takes a job with a tremendous firm, having been seduced by their huge financial offerings. After he was hired by `The Firm,' almost everything started great. The firm loves him very much that they even pay back all of his student loans and also furnished his new house in his beautiful new neighborhood because they said it is to make him feel at home. The lives of Mitc An excellent legal thriller. One of John Grisham's best novels. After he was hired by `The Firm,' almost everything started great. The firm loves him very much that they even pay back all of his student loans and also furnished his new house in his beautiful new neighborhood because they said it is to make him feel at home. The lives of Mitch and his wife Abby are completely and drastically changed weeks after he was hired by the firm. It turns out that they're being set up with a disorienting atmosphere. Now, the couple suspiciously found strange things happening...people getting killed by boat bombs. Good early Grisham legal thriller. The Firm - you can get in, but not out. The offer to young Mitch by a Memphis law firm sounds too good to be true. The skeletons in the closet are plenty - and dangerous. He and his young wife must become creative when squeezed between sinister forces and the government. A tactfully crafted novel that pumps adrenaline relentlessly. Tension rises with each page and Grisham managed ingeniously to keep the pace on a steady-rise basis. Although I found some cracks in the plot here and there,they are negligible comparing with the exhilaration it had given to me. One hell of a read. Good job Grisham. It's very, um, thick. Full of detail. Like, so much detail that it's about a third of the way through before the plot actually really begins. Mitch was kinda flat, though. Everybody was treating him as though he was a much more rounded character than he really was. 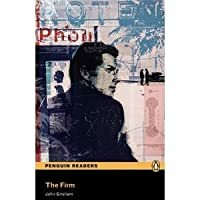 I mean, I'm not complaining: John Grisham still managed to keep me reading, but maybe that was just because there were people conducting subterfuges. Still, the lawyers not suspecting what was going on, when they had all the EVIDENCE in It's very, um, thick. Full of detail. Like, so much detail that it's about a third of the way through before the plot actually really begins. Mitch was kinda flat, though. Everybody was treating him as though he was a much more rounded character than he really was. Still, the lawyers not suspecting what was going on, when they had all the EVIDENCE in front of them, is so stupid. I mean, they're LAWYERS! The trickiest people on the planet! Not only that, they're lawyers who work for the MAFIA! Surely they wouldn't just take the first explanation they see of the evidence?? Surely! Surely not, according to Grisham. So, yeah, I can see why he sells, but not why he sells that well. Two things that also really disgusted me: one, that Mitch cheated on his wife near the beginning, and the photos of him in the act were used to blackmail him, and then at the end he never confesses. If he cared so much, why not confess to her? Sure, it would hurt her, but doesn't he love her and respect her enough not to lie to her? The second thing was that the women in the book were constantly written as though the author was salivating over them, and wanted all the guys to join in, which I personally found really degrading. This was my first John Grisham novel and it won’t be my last. I really enjoyed The Firm! I didn’t know what I expected from this book when I first started it but I knew that something was fishy about the Bendini, Lambert and Locke firm. I mean, seriously they were just so creepy asking all those questions about family and stuff. For such an intelligent man, Mitch can be dumb and ignorant sometimes. I understand the need to be the best and to make loads of money but wow; he took the meaning of wo This was my first John Grisham novel and it won’t be my last. I really enjoyed The Firm! I didn’t know what I expected from this book when I first started it but I knew that something was fishy about the Bendini, Lambert and Locke firm. I mean, seriously they were just so creepy asking all those questions about family and stuff. For such an intelligent man, Mitch can be dumb and ignorant sometimes. I understand the need to be the best and to make loads of money but wow; he took the meaning of workaholic to a whole new level. I respect the fact that he didn’t want to trust the FBI at first but come on! Give them a chance to help out, look at what you, your wife and your brother’s lives ended up without their help. I wish we had more character development for Abby though. She just seemed like Mitch’s sidekick most of the time. I adore Ray, I really wanted more scenes with him. Tammy was also an interesting character. I loved how she does all that spy stuff to help Mitch and his family. The plot kept me on the edge of my seat almost all the time. I couldn’t put it down because I really wanted to know what would happen next. I love all the twists and turns especially in the last few chapters. The ending was a bit of a letdown though but it didn’t spoil the rest of the book for me. 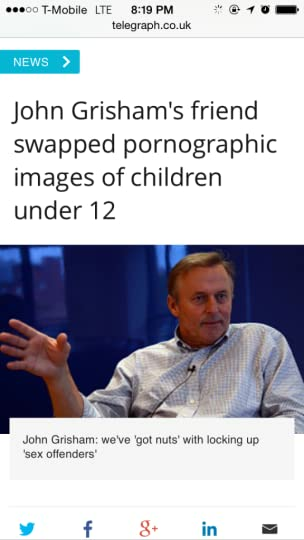 I would definitely be reading more of John Grisham’s work!